In the Roku Streaming Stick+ we love the experience, we love the ease of use and the quality of the stream that we get from it. In a face-off with close rivals, we'd pick Roku every time. In fact, we do pick Roku every time in our own home setup. But do you actually need it? Streaming represents the biggest shift in how we consume content in recent years. Where it might have once been seen as a last resort - somewhere you'd go when you missed something - it's now often the method of choice. After all, why watch broadcast TV or listen to scheduled radio when streaming content on demand fits your routine? That's given rise to connected devices offering routes into content, and Roku has been one of the big players in this area for some time. The Streaming Stick+ is its top offering in the UK, offering Ultra-HD 4K HDR quality (where available) compared to the regular Full HD Roku Express. It's first class streaming, if you will. The Roku Streaming Stick+ gives away its design with its name. Part of recent generation of devices that are based around an HDMI connection and little else - very much started by the Google Chromecast - there's little to concern yourself with, as it's likely to be out of sight once it's connected. But there are some considerations. Where Google adapted the Chromecast and Amazon adapted the Fire TV to have a short flexible cable attached to the HDMI, Roku does not. It's a straight stick about 10cm long, so if the HDMI ports on your TV face back towards the wall, it might not fit - especially on a wall-mounted TV. If this is the case, Roku will send you an adapter to deal with this, but it's not bundled in the box, so consider that before you start installing. If your TV has side-orientation HDMI then you'll have no problem, unless it sticks out beyond the bezel of course. While the Streaming Stick+ is slender - and overall its size is smaller than devices like the Fire TV 4K and Chromecast Ultra - this has partly been achieved by separating an Advanced Wireless Receiver onto a separate power cable. This connects your Roku stick to the power source and you have to use it, so you can't just use any old USB cable. That receiver cable is pretty short, too. If you're lucky you might have a USB port on your TV that will supply enough power, although that tends not to be the case, meaning you have to attach to a conventional mains power supply using the extension cable. This is also the case with Amazon and Chromecast Ultra too, with all these devices wanting plenty of power to supply their 4K content and maintain that solid connection. Now TV Streaming Stick is an exception - but its streaming quality lacks. There's no option for Ethernet with the Roku either. While Chromecast Ultra has wired option integrated into the power supply and Fire TV has an optional Ethernet adapter you can buy separately, for Roku it's not an option and therefore Wi-Fi all the way. The included remote control is a standard Roku remote and it feels sturdy - better than many of the "accessory" remotes of a bygone era that were like credit cards. No, the Roku remote is something you'll actually want to use, which is good, because you'll need to. The Streaming Stick+ sits closer to the Amazon Fire TV 4K in terms of functionality than it does to Google Chromecast, because it has an interface and as we all start to stream more, that's becoming something of an increasingly important factor. We've long been fans of Chromecast's approach, allowing you manage a device (like a TV) from your phone and send content to it. Being able to cast a wide range of content with minimal fuss makes Chromecast a breeze to use, but you have to know what you're doing and some people just cannot fathom how to get it to work. Pitching Roku into a normal family environment and there's likely no confusion. Everyone can grasp what's available and how to get it to work thanks to having a real remote to play, pause and move between content sources. For a UK user (and this might be different for those in different territories), Roku Streaming Stick+ offers all the UK catchup services - BBC iPlayer, ITV Hub, All4, Demand 5, as well as the mainstream services in Netflix, Amazon Video and Now TV. You also get access to Sky Store and Google Play Movies for content you may have purchased or rented, and finally there's the huge presence of YouTube to supply all your cat videos, make-up tutorials, phone reviews and how-tos on just about everything you can imagine. That covers most bases for content, but there are a range of additional channels you can access if you really want. We can't profess to venturing into anything outside the core listed above. There are four services with direct links on the remote - Netflix, YuppTV, Red Bull TV or Rakuten TV - with Netflix being the most useful. We're not sure what the real demand is for the other three, but we're guessing they pay to be on the remote. In reality, it's a shame you can't re-programme these buttons to suit your personal viewing preferences. The Roku interface is customisable, letting you change the visuals for something of a personal look. Nice big icons represent each of the services, although Roku also offers searching, so you can find content to watch easily. There's no voice searching as you'll get on Fire TV thanks to the Alexa Remote or the Now TV stick, but it's easy enough to seek and find. For the most part, we expect that most people will sign into services they subscribe to and then head straight to that player to access content. The players are familiar, but not identical to other streamers and apps. Head into Amazon Video or Google Play Movies, for example, and things are a little different visually, although the content is all the same. Performance wise, we can't fault the Roku Streaming Stick+. We've found that the Advanced Wireless Receiver offered a consistently solid connection on our home network, offering 4K HDR content without a hitch. Of course the programming is offered at variable bitrates depending on the streaming conditions (and source app), but where we've had Chromecast Ultra drop off the network or fail to connect, Roku is much more stable by comparison. We've now been using the Roku Streaming Stick+ for the past year and the performance has continued to be solid. The Roku Streaming Stick+ supports HDR10, but it doesn't extend that to HDR10+ or Dolby Vision - which Amazon's latest do support. It does support Dolby Atmos via passthrough, although naturally you'll have to have that passed to a sound system that supports it. Navigation around the Roku user interface is also nice and clear. The remote offers an important home key that returns you to the central menu, while the back arrow moves you back through content levels, so if you're diving into entertainment on Now TV, you'll often need to use the back arrow to move up a step to explore something else. Other control is centred around a four-way pad and ok button, while play/pause is joined by skip forward and back buttons. There's no jump to start or end, so sometimes you might have to open up an on-screen controller to make larger jumps around content, skipping to different scenes easily, for example. It's also worth noting that the Roku device itself has no universal parental controls, these are all managed by the controls within individual apps. On the whole, it's a very smooth experience and we've got to say, one of the best media streamers when it comes to reliable and straight-forward use. Although the Roku Streaming Stick+ isn't designed as a casting device like Chromecast, it still supports a number of in-app casting protocols. This is fairly common for services like YouTube and Netflix, both of which allow phone-based control - selecting content to playback on your Roku. This can make it easier for finding content - because you have the advantage or touchscreen scrolling for example - and in many ways, gives you some of the advantages of the Chromecast. Just remember that support for these functions doesn't extend to the full range of Chromecast-enabled apps, so there's no support for this approach in BBC iPlayer or Now TV, for example. There's also wider support for your own content in the Roku app. This will let you dive into the gallery on your phone and play photos, video and music on your TV too - although the navigation of that content is a little basic, especially when it comes to video, where the app failed to find files not in the correct folders. But do you really need 4K HDR streaming? The problem we have with all streaming devices at the high-end - i.e., those supporting 4K HDR content - is whether they need to exist at all. This new-fangled 4K HDR is fairly new. While 4K TVs have been available for perhaps four years, HDR is newer, thus finding a 4K HDR TV that doesn't offer the streaming apps that the Roku Streaming Stick+ offers is rather rare. Take that further to Dolby Vision and we don't know of a DV set that doesn't offer the majority of these features already. So you might be able to see the dilemma here: if you own a smart 4K TV, you probably don't need a streaming stick. So there's no need to spend £60 on this Roku device, as your TV can almost certainly do it all already. The only exceptions are likely to be those TVs at the more affordable end of the scale. Own-label supermarket TVs might fall into this category, or, if you have a gaming monitor, for example, you might decide that this is the best way to get your content onto there, rather than using a connected console (and you'd be right, it's much smoother via Roku than apps on an Xbox One, for example). For all those with an older HD or Full HD TV who want to add smart features, then the Roku Express is likely to be a better choice: it offers all the same services, but is much cheaper because it doesn't venture into 4K HDR - and if your TV doesn't support it, then you don't need that. There is a caveat to all this, however. Roku is good at keeping its services up to date, which not all TV manufacturers do and it's a stable experience. With the price of the Streaming Stick+ at only £60, it's almost worth buying because you want Roku's user interface. There might be another factor and that's Apple. With rumours that Roku might support Apple AirPlay 2, that could make this streaming device a great way to get content from your phone to your TV. For every streaming devices that we look at that supports 4K HDR, the message is the same - we said it of Chromecast Ultra and of Amazon's Fire TV. In each case, there needs to be a unique selling point that seals the deal for you. For Chromecast Ultra, it's casting support beyond entertainments services, supporting Google apps or Chrome casting, for example. For Fire TV, the appeal is integration with Alexa, being able to talk to the remote and cast Amazon Video directly. If you're a Prime subscriber, then that's a benefit. If you have an Echo, then wider voice control is also appealing. 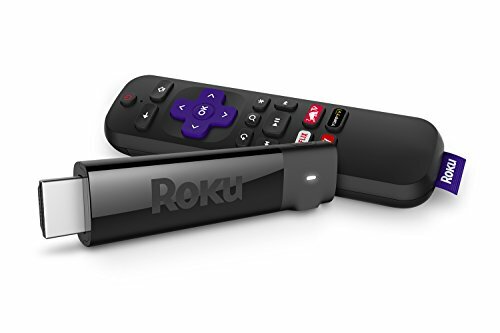 For the Roku Streaming Stick+, we love the experience, we love the ease of use and the quality of the stream that we get from it. In a face-off with those devices we've just mentioned, we'd pick Roku every time. In fact, we do pick Roku every time in our own home setup. It's the interface, support and ease of use that sells the Roku experience. So while this is a first class streaming experience, the important thing to figure out is what your TV can already do and whether you actually need to buy it. If you do, then it's an easy decision to make. Google's streaming solution is about as simple as it gets, connecting to your TV and then giving you smart features and controls via your phone. There's no user interface or remote, which is a downside in the conventional sense, but there is support from some major entertainment platforms like Netflix, YouTube, Google Play Movies, BBC iPlayer and more. It also provides an avenue for connectivity between your phone and TV, with browser casting and other goodies. There's also support for Google Assistant. Amazon's media streamers keep getting smaller and more affordable, with features like Alexa voice control via the remote making it a no brainer for fans of Amazon's system. You do get a user interface so it's easier to manage than the Chromecast, but it leans towards Amazon's content. That said, it does cover all services and supports 4K HDR formats and Dolby Atmos, making it technically more proficient than the Roku Streaming Stick+.